The Cure to play Lollapalooza? The rumor that we've had every year since the beginning of time is popping up again. The Cure are rumored to be playing Lollapalooza, but this rumor may actually be true. The official lineup announcement is scheduled for April 9th so I guess we will know soon enough. Nothing to get excited about, and obviously just speculation, so we'll wait and see if there's anything to it. Also, the image posted on those websites, which seems to be the only reason The Cure are being mentioned, is 99% confirmed to be a fake. Update (03/11/13): Okay, time to take this a bit more seriously. The Cure are now listed as "logical" at the Consequence of Sound Festival Outlook page, since it's the same weekend as Osheaga, and has been pointed out that the two festivals usually share many of the same bands. Update (03/26/13): Rumors continue to be very strong on this, and it's moving towards being more of a surprise if they DON'T play Lolla, than if they do. All of the General Admission 3 day passes sold out today (VIP & Platinum passes still available), so only one day passes will be available when the official announcement is made on April 9th. Expect some lineup hints & clues leading up to that. The official lineup will be announced next month, but according to NBC 5 Chicago, they already have ideas for a lineup. Pretty darn cool. Hope this rumor comes true for the folks going to the festival! It certainly is looking quite likely! We have a festival-world tour officially! Cheers! Its like a Cure tour on a budget...for them, not us as festivals are really pricey and personally I'd rather pay that money for a Cure only show. But I understand that it allows them to play in more places. And now the Chicago Tribune has weighed in. The Cure and Nine Inch Nails will join previously confirmed acts Mumford & Sons, the Killers, Phoenix, Vampire Weekend, the National and the Postal Service at Lollapalooza in Grant Park on Aug. 2-4. 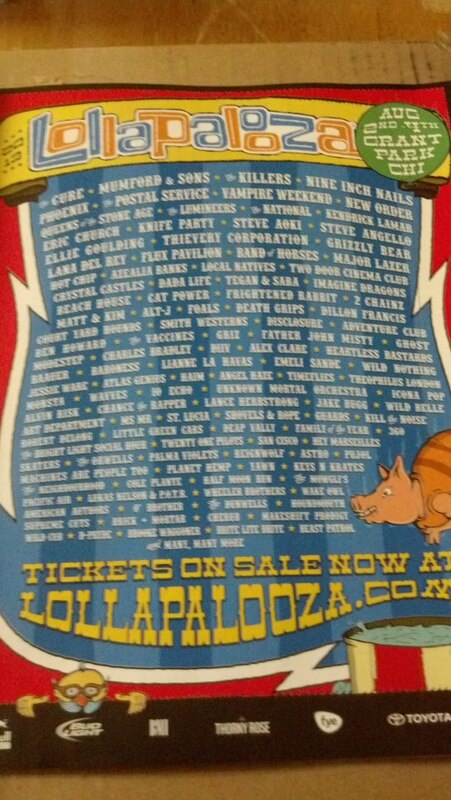 Multiple industry sources confirmed Thursday that a picture of a Lollapalooza poster that leaked on-line Wednesday night was legitimate. Lollapalooza spokeswoman Shelby Meade would not comment on the leaked lineup, but said official confirmation of the actual lineup would come next week with a new on-sale date for single-day tickets (three-day tickets have already sold out). Queens of the Stone Age, the Lumineers, Kendrick Lamar, Eric Church, Knife Party, Steve Aoki, Steve Angello, Ellie Goulding, Thievery Corporation, Grizzly Bear, Lana Del Rey, Flux Pavilion, Band of Horses, Major Lazer, Hot Chip, Azealia Banks, Local Natives, Two Door Cinema Club, Crystal Castles, Dada Life, Tegan & Sara, Imagine Dragons, Beach House, Cat Power, Frightened Rabbit, 2 Chainz, Matt & Kim, Alt-J, Foals, Death Grips, Dillon Francis, Court Yard Hounds, Smith Westerns, Disclosure, Adventure Club, Ben Howard, The Vaccines, Griz, Father John Misty, Ghost, Modestep, Charles Bradley, DIIV, Alex Clare, Heartless Bastards, Baauer, Baroness, Lianne La Havas, Emeli Sande, Wild Nothing. Jessie Ware, Atlas Genius, Haim, Angel Haze, Timeflies, Theophilus London, Monsta, Wavves, Io Echo, Unknown Mortal Orchestra, Icona Pop, Alvin Risk, Chance the Rapper, Lance Herbstrong, Jake Bugg, Wild Belle, Art Department, MS MR, St. Lucia, Shovels & Rope, Guards, Kill the Noise, Robert Delong, Little Green Cars, Deap Vally, Family of the Year, 360, the Bright Light Social Hour, Twenty One Pilots, San Cisco, Hey Marseilles, Skaters, The Orwells, Palma Violets, Reignwolf, Astro, Pujol, Machines Are People Too, Planet Hemp, Yawn, Keys N Krates, the Neighbourhood, Cole Plante, Half Moon Run, The Mowgli's, Pacific Air, Lukas Nelson & P.O.T.R., Wheeler Brothers, Wake Owl, American Authors, O' Brother, the Dunwells, Houndmouth, Supreme Cuts, Brick + Mortar, Cherub, Makeshift Prodigy, Wild Cub, D-Pryde, Brooke Waggoner, Brite Lite Brite, Beast Patrol. ROBERT SMITH I. HATE. YOU. There is NO WAY I am going to the city of Chicago alone and at night. I like The Cure ALOT, but not enough to get mugged and raped. Looks like I'll have to wait another 4 years to see them. That is, if they're still touring then. You would not be able to get someone to accompany you? Btw, who's going to Lollapalooza if the lineup will be confirmed?